“I think we’re going the wrong way.” The midday sun shines brightly on a nice and warm day. There are a few scattered clouds but, thankfully, no signs of rain. The roads are empty, probably because it’s a weekday, and the neighborhoods appear quiet, as if everyone has gone to enjoy a siesta. Masood is behind the wheel and I’m the navigator. I am using Google Maps, following the directions accurately, yet we somehow end up on a remote organic farm manned by a kind-looking gentleman who doesn’t speak a word of English. Eventually, we got on a road with signs leading us to the correct path—The Oriental Village on the upper northwest of Langkawi Island, near Pantai Kok. The crowd is scant and the weather is clear, albeit a tad humid. There is hardly a queue at the ticket counter and we have a great experience overall. 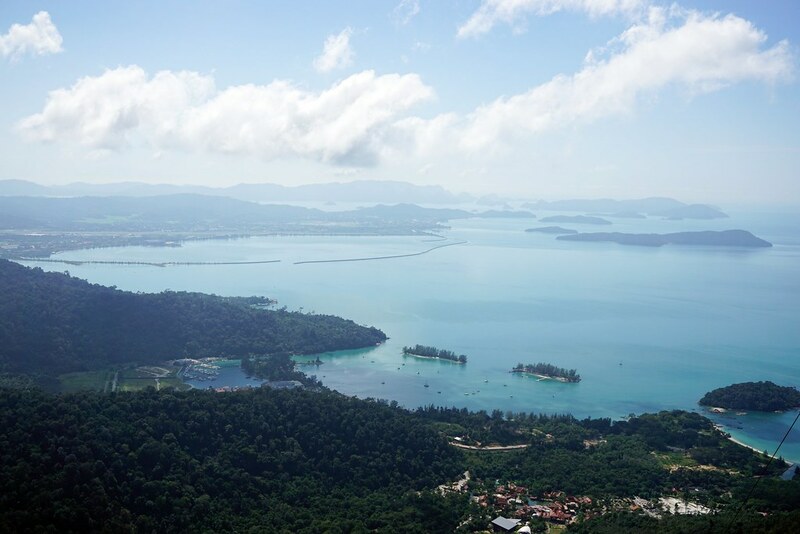 I have made a few observations during my trip and thought I’d share them to help you on your first experience of the Langkawi Sky Cable and Sky Bridge. Check the Weather Report. Every Hour. 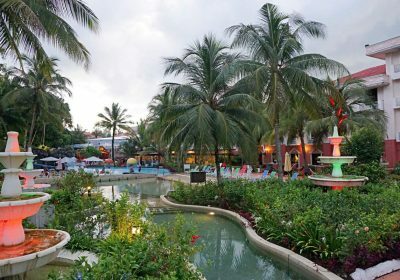 This is an example of how a tropical place, such as Langkawi, changes its moods by the hour. Find out the chances of rain. Figure out whether or not it’s going to be cloudy. You don’t want all your selfies to have a white foggy background. It’s nice to go up there on a hot and sunny day as opposed to being greeted by fog or rain. Plan your trip based on the weather report. We went on a weekday at midday. There were hardly any local tourists and only a handful of foreign visitors. Most people visit in the morning, between 9-11 am, so I would suggest avoiding those timings. Not only are you going to spend a frustrating amount of time queuing, your pictures are going to be ruined by a dozen other tourists in the background or their selfie sticks making an appearance in that well-framed photograph. Someone suggests going there at 5 pm and watch the sun set from the Sky Bridge. Please remember though that there are higher chances of fog in the evening so it’s still a better idea to visit during the day. Here’s what you can do: buy your tickets online to save time. Rent a car and be the first ones there in the morning. Like, go there when the place opens, at 8 am. Ideally, rent a car at the airport when you land (this is what we have done and it’s the best decision we made). Note: The fees for the gondola ride is separate from the entrance fees to the Sky Bridge. Don’t Waste Your Time at the Sky Dome. “The Sky Dome experience is a nausea-inducing nightmare, poorly executed with graphics that would be at home in a 20-year-old computer game,” says a tourist who just returned from Langkawi. He couldn’t have said it better! Trust me, this will not make the waiting time less excruciating. It will probably annoy you more. What is this Sky Dome? It’s basically a room with seats for about 50 people. It is equipped with 12 projectors. Once everyone is settled in, the lights are switched off, and a headache-inducing 360-degree movie about a rollercoaster ride in Mars is projected on-screen. The graphics are horrible, the background music even worse. I’m sure the kids will find this interesting, but adults can definitely skip this. Skip the Middle Station if it’s Crowded. From the base—where you are subjected to that Sky Dome roller coaster movie—you get into the cable car. The next stop is the Middle Station. Here, you are almost forced to take a picture in front of a blue background (or was it green?) that the staff can Photoshop later. There’s a small circular platform where you can enjoy the same view that can be seen from the Sky Bridge. That’s pretty much it. You may stop here briefly, like we did. However, if it’s crowded, it means you’ll have to fall in line again to get into the cable car up to the next station. I suggest skipping the Middle Station. 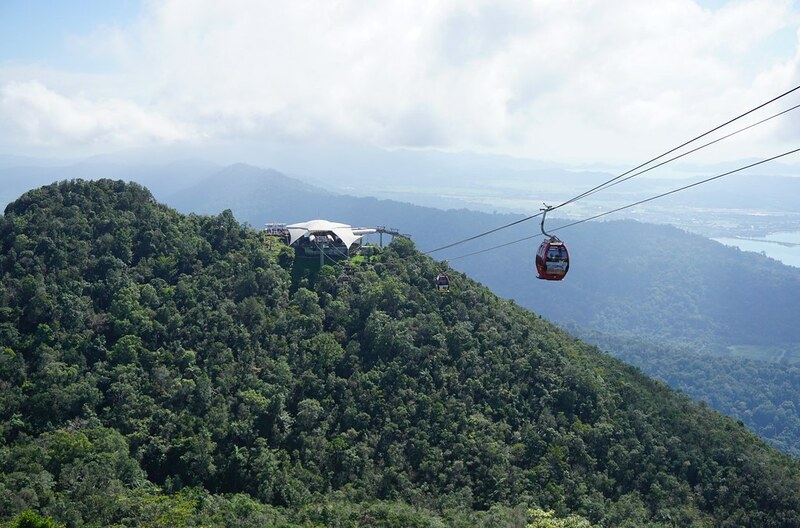 Stay put in your cable car and continue making the journey on to the Top Station. 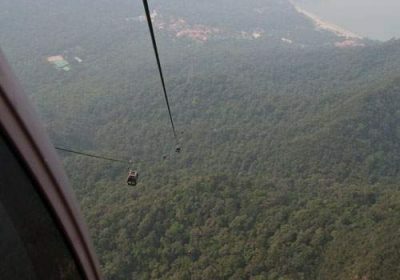 If You Have Money and Courage, Ride the Glass-Bottomed Cable Car. I have neither the courage nor the desire to part with my hard-earned money. So it’s the regular gondola for us. The ride takes you up, several feet above dense jungle. The gondola isn’t air-conditioned but there’s a tiny window open on the top for ventilation, through which you can even hear the wind howling. The gondola sways and it makes jerky movements. When it leaves the platform, you briefly feel like you’re bring thrown out there in the jungle. However, if you want to make it a truly memorable (and heart-stopping) experience, go ahead and spend on that glass-bottomed gondola. Look down and see the tree tops. The queue to this type of gondola is short and I’m told you don’t even have to share the gondola with other visitors. Note: When going up, don’t forget to look out for the Telaga Tujuh Waterfall on your right! The slope between the Base Station and the Middle Station is said to be the steepest in the world at 42 degrees. This is why when there are strong winds the cable car operation closes down. The views of the forest below, while scary, are nonetheless spectacular! Splurge on the Sky Glide to Take You To and From the Sky Bridge. 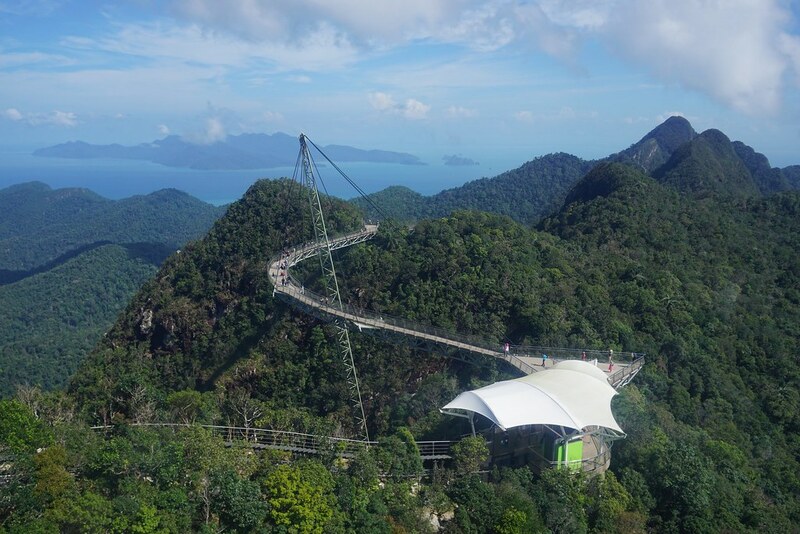 You can NOT miss Langkawi’s Sky Bridge! The Langkawi Sky Bridge is a curved pedestrian cable-stayed bridge that was completed in 2005. 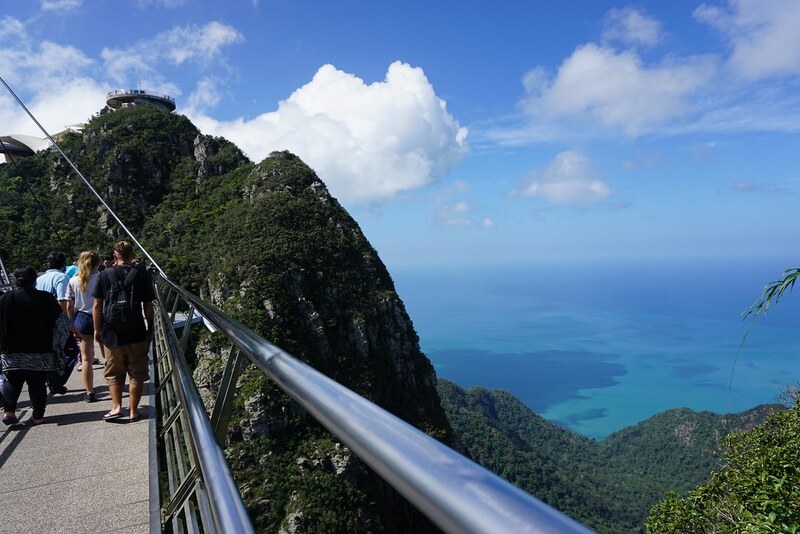 The bridge deck is located 2165 feet (660m) above sea level at the peak of Gunung Mat Chinchang on Pulau Langkawi. Now, I haven’t experienced or seen it myself, but I’m told the hike getting to the Sky Bridge and back to the Top Station is difficult and not suitable for the elderly. 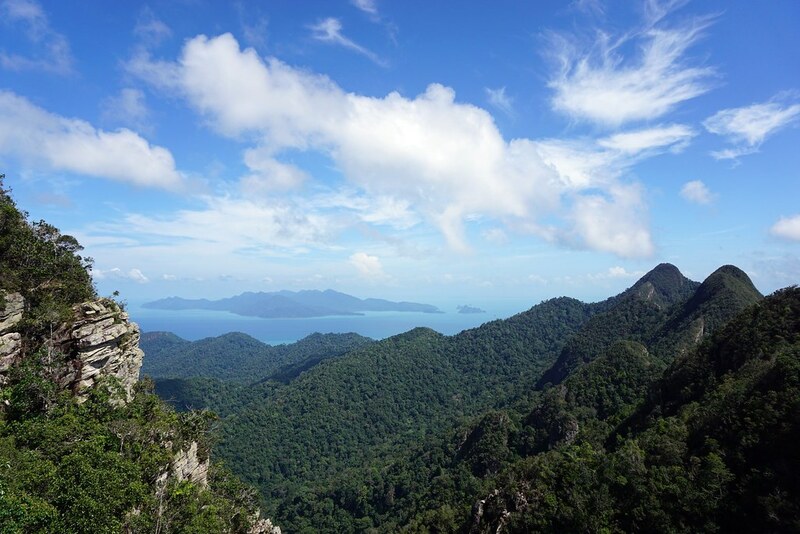 Plus, don’t forget the hot and humid weather of tropical Langkawi. Instead, take the lift that is called by a fancy name: Sky Glide. 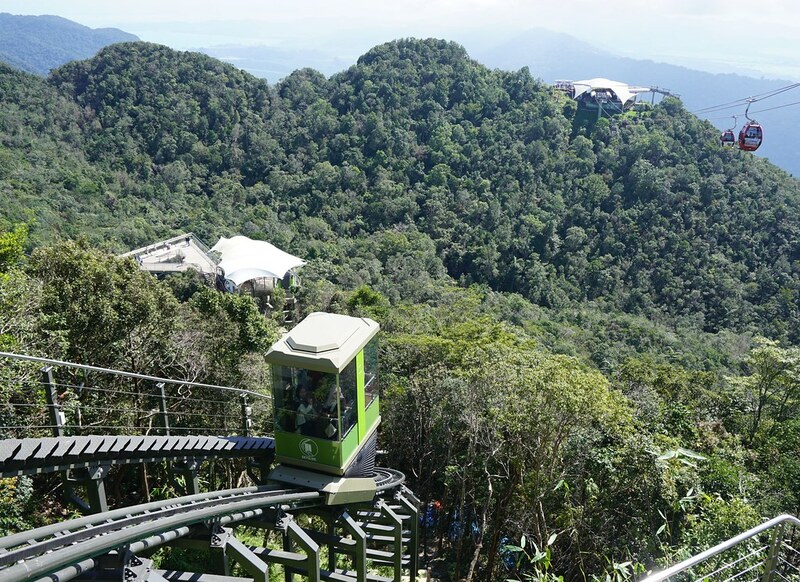 For MYR 15 (as of December 2016), you get a comfortable ride to the Sky Bridge and back to the Top Station for your cable car ride back down to the base. On the way down, we had the pleasure of sharing the gondola with a very friendly and jolly Chinese-Australian couple. They were both perspiring, their faces flushed from the exertion of hiking from the Sky Bridge to the station. “We’ll definitely take that lift next time!” they said. Spare a Minute to Have Your Picture Taken In Front of a Green Screen, or Just Decline Politely. Is there really a need to have photographers and green screens positioned at each stop? Now, while I understand that they’re just doing their job and following orders, these young men and women can get quite persistent – bordering annoying, to be frank. They absolutely insist that you position yourself in front of a green screen, facing several other tourists, and they’d even suggest a few poses to help you. Honestly, it feels extremely awkward and forced. In a minute and two, they will let you go on your merry way. On your way back, they’ll spot you and show you the Photoshopped images so that not only is your face unnaturally smooth and blemish-free, you have the gondola or Sky Bridge behind you in a weird and unflattering manner. If you somehow end up liking the photos, you buy it. Or you can just refuse. We politely declined to have our picture taken at the Middle station, and that worked well. Things did not go so smoothly on the Sky Bridge, however. We smiled and said no. The lad got hostile, “It is compulsory to take photo!” “Says who?” asked Masood. The angry young man got angrier, reached out to touch Masood’s arm (and not in a friendly manner) and began yelling at us that he had orders from the management and that we had to comply. We distanced ourselves from him, his angry loud voice reaching us as we walked away. On our way back from the bridge, we went looking for the person holding the highest position on duty at the Top Station. He turned out to be another young man, but he was patient, kind, and respectful. We explained the situation to him. He profusely apologized, called the angry photographer and asked him to apologize to us. The angry photographer stood up on his toes to make him appear taller, brought his face mere inches from Masood’s, looked straight into his eyes, and blurted out a not-so-sorry-sounding apology. The manager on duty told him something in Malay and the photographer left. It’s hot and humid. You’re not permitted to take your water bottle with you in the cable car. But you can buy water or juice from the shops located at the Base or Top Stations. Wear sunglasses. The sunlight is just too bright to be without. It hurts the eyes. Wear a good sunscreen. Wear a good-fitting hat, if you may. Just make sure the wind does not blow it away. Wear comfortable clothes and shoes. And since it can get windy, better avoid wearing light, flowing dresses. Lots of taxis wait outside the park, so transportation isn’t an issue (although I would recommend renting a car from the airport when you land and driving around town yourself, petrol is cheap and traffic is non-existent). There are several halal food outlets at the Base Station, clean bathrooms, and a nice prayer room. Again, so many people did not know this and got frustrated: you pay for the cable car ride, you pay separately for the Sky Bridge (there’s a ticket counter at the Top Station) and then you pay separately for the Sky Glide (the lift, should you choose to take it). If you’re buying a package deal, make sure you know what is included. On the Sky Bridge, there are glass panels. Take off your shoes, step on it and look down at the dense forest. I’ve seen people lie down on it and get all excited. The bridge vibrates, perhaps due to the people walking on it or the wind. It adds to the thrill. The views from the Sky Bridge are spectacular! Take lots of pictures! Wow! Your website is up and i love the new revamped design. Good that ive subscribed to your posts 🙂 So clean, easy to navigate and the logo is beautiful! 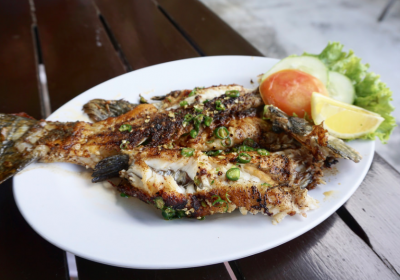 Keeping in mind the tips here when we visit Langkawi. Thank you so very much, Joanna! The current blog theme and its setup took two months! But considering the content and images on this blog, magazine style suits better than all my older themes. Appreciate the feedback! You are most welcome! 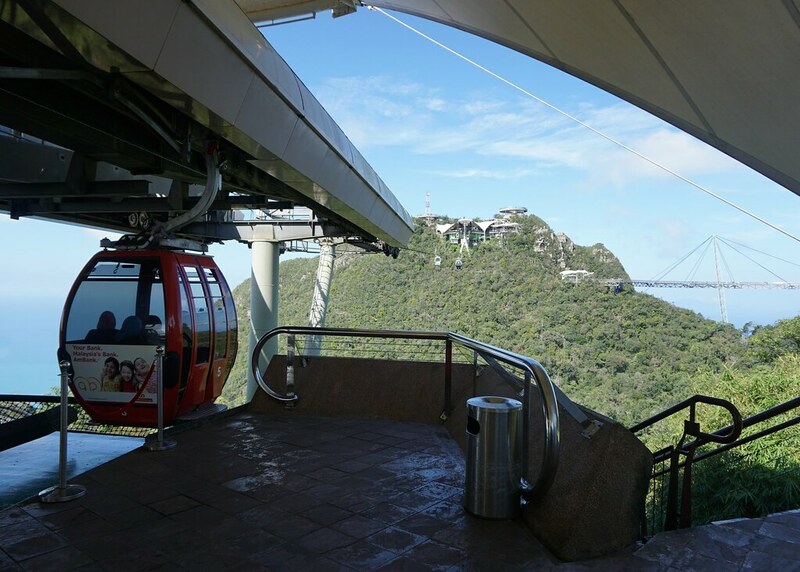 The views are indeed stunning from the both the cable car and the Sky Bridge. Definitely a must-do when in Langkawi. Thank you so much, Grace! No, you’re not late at all … it’s all new here. In fact, it’s still a work in progress. Hi Nadia! 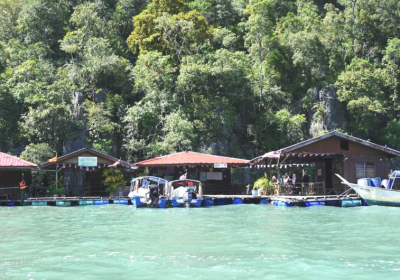 Thanks for the useful tips to this must-visit location in Langkawi. This really helped a lot in my itinerary planning for time saving. I’m so glad you found the tips useful! I hope you have an amazing trip to Langkawi. Very nice and informative. I have bookmarked this page as I would be visiting next month. Roughly how much time does it take overall for sky cable car and sky bridge if I go on weekday afternoon. Are any documents needed for renting a car and what’s the approx price per day for rented car ? Thank you so much, Vaibhav! I would suggest allocating about 3 hours for both sky cable car and sky bridge. Documents that we showed them were our passports and driving license. I don’t recall the exact amount we paid for the rental car, but please check this website for an idea. Hope this helps.